Tips for your scratching tree - the right location! You are here: Home / Blog / Cat Advice / Cat scratching trees – the right location! Cat scratching trees – the right location! Tips for your scratching tree – why it is so important to pick the right location! Offering an outlet for clawing and scratching is not the only reason why a scratching tree is so important for cats. 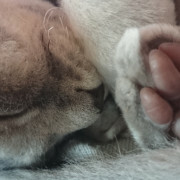 It is true that cats use the post to keep their claws in good shape, and that scratching is a way for them to mark their territory – but cats are also self-presenters. 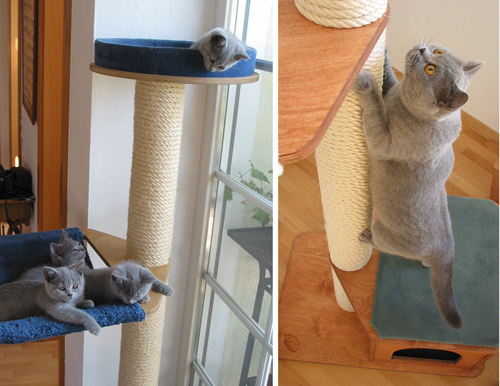 They want to get themselves involved in their surroundings by climbing, playing, and scratching – because even the most beautiful pose is meaningless without an audience! You will notice that your cat is particularly motivated when the humans it lives with or other cats are around to see its self-presentation. Cats want to observe – they want to play a part in the domestic lives of their fellow inhabitants. They are interested in other cats and pets – but the goings-on of their human friends are particularly important. Cleaning, ironing and cooking are all sources of entertainment for your cat – watching this “cat cinema” and being present in your daily life are also critically important for your cat’s mental wellbeing. Never put the scratching post in distant rooms, or in confined corner spaces. Do not clean the scratching post with chemical cleaning products. Traces of dangerous cleaning products can be absorbed during grooming, and cats do not like the sterile smell. 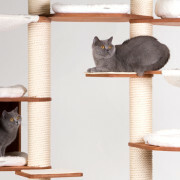 Play on the new tree with your cat. 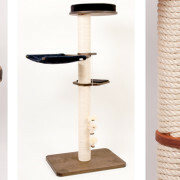 Let your cat watch how you scratch the post with your finger nails (as enthusiastically as possible!). Praise your cat when it scratches and climbs on the scratching tree, and when it explores the flat surfaces for it to lie on. The space around the scratching post should be kept as clear as possible – so make sure there is enough room. This means that your cats can climb up or down the post from all angles – and they will not feel claustrophobic, which is a frequent source of conflict. 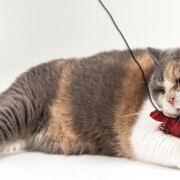 If your cats are prone to fighting, a two-pronged scratching tree is worth considering – your cats can switch posts and do not have to disturb other sleeping cats when climbing up or down. The higher horizontal surfaces for sleeping and hammocks are generally the most popular. If you have several cats, you should make sure that there are enough high horizontal surfaces available for them to lie down on. You might also be interested in: Why do cats like scratching – and why is it important to have a scratching tree? Advice on scratching trees – why do cats like scratching? Which cat is right for me? Part 2 Advice on scratching trees – why do cats like scratching?